Please be advised: Players from United Kingdom are not accepted at VIP Slots Casino. Try one of the three casinos below, as they welcome UK players with great bonus offers! VIP Slots’ player-friendly website design and VIP theme appeal to Australian online casino players. The online casino supports real money play in AUD and offers banking methods that are convenient for Australian players. Its biggest selling point is its welcome bonus of $1000. VIP Slots is a mobile, live dealer, and online casino with a large number of exciting features. The highlights of the online casino are its 24/7 customer support, games from two providers, weekly bonus offers, and a multi-level rewards program. We found that the online casino takes player privacy seriously. It also has an effective responsible gambling policy, through which it prevents underage gambling, offers support to problem gamblers, and encourages players to gamble responsibly. 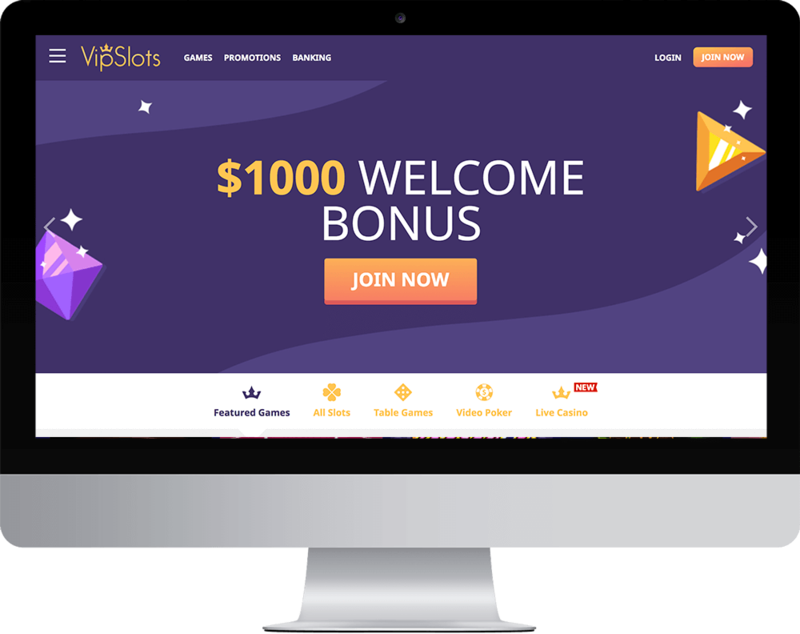 VIP Slots offers games from two providers, Betsoft and Arrow’s Edge, on a browser-based software platform that is compatible with a variety of browsers, operating systems, and devices, including iOS and Android smartphones and tablets. The online casino does not offer any casino software download option. Getting started is as simple as signing up, making a deposit, claiming the bonus, and playing on the browser. Players can play the games, including the live dealer games, for fun or real money. Clicking on the Games link in the main menu on the casino homepage takes players to the game portfolio. Finding games is easy because of the large number of filters available. Players can also use the search bar to quickly find their favourite games. This is a selection of jackpot slots, classic slots, and bonus slots. Players can choose from a variety of 3D slots, mystery jackpot slots, super jackpot slots, five reel slots, cash grab jackpot slots, and progressive slots. Some of the most popular titles include Arcade Fortunes, At the Movies, Aztec Treasure, Black Gold, Back in Time, and Boomanji. Play multi-hand, single-hand, and pyramid video poker games. Get started with simple, but entertaining video pokers such as Double Bonus Poker, Bonus Poker, All American, Joker Poker, Deuces Wild, and Double Bonus Poker. VIP Slots offers four live dealer games—European Live Roulette, Live Baccarat, Live Blackjack, and American Live Roulette. The most popular games are The Golden Owl of Athena, Game of Kings, Fruit Zen, Bonus Poker, More Gold Diggin, and Blackjack Single Deck. The online casino offers popular variants of Blackjack, Roulette, and Baccarat. VIP Slots allows players can play their favourite games on their iOS and Android smartphones and tablets from any part of Australia. All they need is a gaming account at VIP Slots, a fast and reliable Internet connection, and a mobile device that supports HTML5 technology. To get started, players don’t need any native mobile casino gaming app or third-party software on their devices. 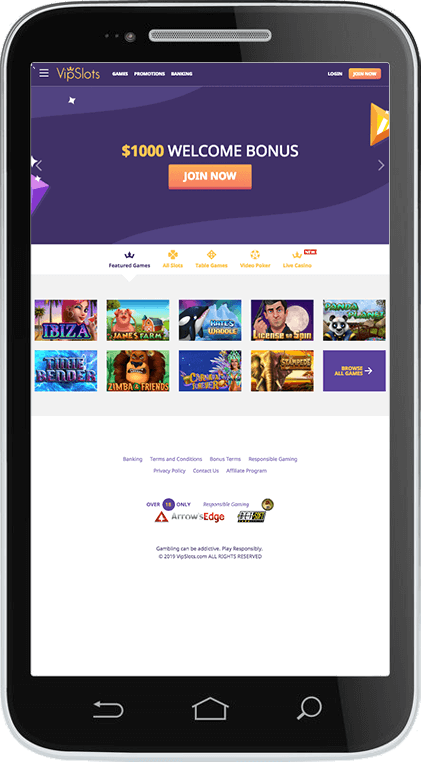 They can enjoy a 100% browser-based mobile gaming experience by simply visiting the online casino on their mobile device browser and logging in to their gaming accounts. Since the gaming platform is based on HTML5 technology, the quality of the gaming experience does not change with the device used. This means that players can enjoy the ultimate VIP Slots gaming experience on the move. They can make deposits and withdrawals, claim bonuses, participate in promotions, earn rewards, and win big cash jackpots on their mobile devices. The most attractive feature of VIP Slots is its promotions page. The online casino starts with a three-level welcome bonus of up to $1000 and continues to offer reload bonuses and free spins every week, special email offers at weekends, weekly rebate of 10%, and exciting rewards for loyalty. Exclusive Email Offers: Every weekend, the online casino sends emails to its loyal players. These emails contain details of reload bonuses and free spin offers they can claim by just making a qualifying deposit. However, these offers expire over the weekend. So players should grab them at the earliest possible. Weekly Offers: Every week, players can claim reload bonuses, free spins, and deposit bonuses at the online casino. Claiming these offers is as simple as making a qualifying deposit and inputting the relevant bonus code. Monday Free Spins: Every Monday, the online casino gives 30 free spins to players who deposit at least $15 in their gaming accounts. Weekly Rebate: VIP Slots credits 10% of the losses incurred during the previous week into players’ accounts every Tuesday. VIP Slots rewards players for their loyalty through a 10-level VIP Club. Players have to achieve higher levels to claim larger reload bonuses and deposit bonuses. They can do so by playing for real money as much as possible. The online casino’s VIP Club contains the following levels—Ivory, Onyx, Platinum, Amber, Bronze, Silver, Gold, Diamond, Emerald, Ruby, Topaz, and Red Diamond. The rewards get bigger as the levels achieved get higher. For example, Amber players get 10% reload on all deposits while Red Diamond players get 100% reload bonus on all deposits. Banking is safe, secure, and easy at VIP Slots as the online casino has partnered only with reliable payment processors. The best way to make deposits at VIP Slots is with Visa & MasterCard and prepaid gift cards. These options are absolutely free and the deposits are instantly credited. Players can make a minimum deposit of $20 using these methods, but the maximum deposit limit varies from one VIP level to the other. Players desiring anonymity must use Bitcoin. Bitcoin deposits are free, anonymous, and instant. Players can deposit a minimum of $20 to a maximum of $10,000 with Bitcoin. If you plan to deposit over $200, QuickCash is another great deposit option. However, you will be charged $10 if your deposits go below $200. Players can deposit a minimum of $100 to a maximum of $690 using QuickCash. Making withdrawals is just as easy as making deposits at VIP Slots, especially as its payout team functions five days per week from 10:00 a.m. to 4:00 p.m. EST. Bitcoin: To use Bitcoin as a withdrawal option, players have to first use it as a deposit option. Players can make one Bitcoin withdrawal per 30-day period for free. Subsequent withdrawals cost a transaction fee of 5% up to $60. Bank Wire: Bank Wire withdrawals are not only slow, but also expensive. Each transaction costs $40 and the funds take up to 12 days to arrive. The minimum/maximum withdrawal limits are $100/$2500 per seven days. QuickCash: If you want to withdraw your winnings faster, QuickCash is the option to choose. You will get your money in 48 hours, but you have to pay a transaction fee of 8% up to $50. You can withdraw as much as $300 every seven days. The online casino requires players to submit photographs of documents that prove their identity, fronts/backs of credit cards, and filled credit card authorization forms before requesting payout for the first time. Players have to undergo this procedure for security purposes and also to ensure quick and hassle free withdrawals. Toll-free Telephone: Australian players can call the number 1-800-953265 for toll-free support. Live Chat Clicking on the Live Chat option on the casino website will instantly connect players with a customer support agent. Email: Players can send an email to support@vipslots.com for customer support, payouts@vipslots.com for questions related to payouts, and signup@vipslots.com for new player queries. Australian players can rest assured that we have thoroughly researched and tested this online casino before recommending and reviewing it. We couldn’t come across any serious player complaints about this online casino. Registered players at VIP Slots agree that its best features are its bonuses and rewards for loyalty. We would have liked to see games from more providers in portfolio, but the present portfolio is still impressive as it includes all varieties of online casino games, not just slots. You definitely won’t regret playing for real money at this online casino.